The threshold of a laser is the state where the small-signal gain just equals the resonator losses. This is the case for a certain pump power (the threshold pump power), or (for electrically pumped lasers) a certain threshold current. Significant power output, good power efficiency and stable, low-noise performance requires operation well above the threshold. A low threshold power requires low resonator losses and a high gain efficiency, the latter being achieved e.g. by using a small laser mode area in an efficient gain medium with limited emission bandwidth. 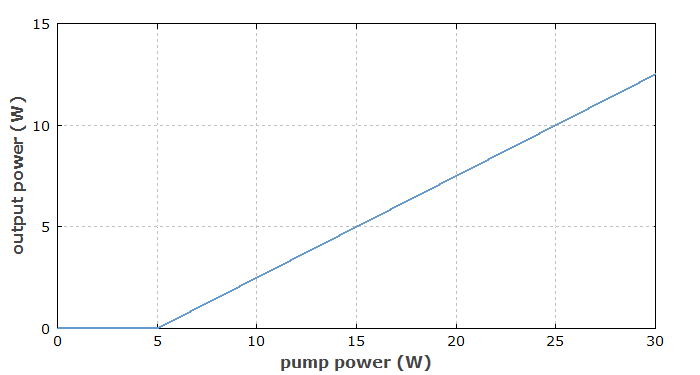 The optimization of the laser output power for a given pump power usually involves a compromise between high slope efficiency and low laser threshold. However, an overall optimization of laser performance may have to take into account additional aspects, such as the achievable pulse duration in a Q-switched laser, avoiding Q-switching instabilities in a mode-locked laser, or minimizing thermal effects. The question of which value is most appropriate for the threshold pump power is one of the issues of laser design. Even for operation below the laser threshold, the gain medium emits luminescence (for optically pumped lasers, this can be called fluorescence). Above threshold (in continuous-wave operation), the intensity level of the luminescence is typically clamped to values close to that at the laser threshold (→ gain clamping). Just below threshold, a laser already emits some power which results from amplified spontaneous emission and has a bandwidth which is large compared with the above-threshold laser emission, but small compared with the regular luminescence bandwidth. 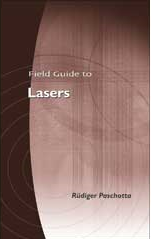 The fundamental origin of the laser threshold is the power loss via luminescence into a large number of spatial modes (propagating in all directions). Under certain circumstances, it is possible to obtain a thresholdless laser by suppressing the luminescence with a microcavity. Most lasers are operated with a pump power which is just a few times the threshold pump power, i.e., the pump parameter is often order of 3–10. This is often a good regime, since a lower threshold could not significantly increase the efficiency but could introduce problems related to, e.g., too high intracavity intensities.